Preaxostyla is a group of anaerobic/microaerophilic protozoa, uniting two subgroups: the oxymonads, which are commensals or symbionts of animals, and the free-living taxon Trimastix. The identifying morphological synapomorphy for the group is the ‘preaxostylar’ structure of the non-microtubular “I” fibre - the I fibre of Trimastix is homologous to the non-microtubular portion of the oxymonad axostyle, and similar in cross-sectional appearance (see Simpson, 2003). Preaxostyla is one of several groups within Excavata characterized by a lack of classical mitochondria. The taxon Preaxostyla was established to recognize the well-supported relationship of Trimastix and oxymonads in molecular phylogenetic analyses (Simpson, 2003). Prior to the use of molecular data, both Trimastix and oxymonads were hypothesized to be related to a variety of other eukaryotes, but none with much certainty (see Dacks et al., 2001 for discussion). SSU rRNA gene phylogenies including Trimastix and the oxymonad Pyrsonympha showed the first strongly supported position for either lineage, as sisters to one another (Dacks et al., 2001). This has been further supported by other single- and multi-gene phylogenies (Hampl et al., 2005; Hampl et al., 2009; Slamovits and Keeling, 2006). The relationship of Preaxostyla to other eukaryotes remains less certain. They were proposed to be members of the Excavata based on the typical excavate structure of the cytoskeleton of Trimastix (O’Kelly et al., 1999; Simpson et al., 2000), remnants of which were subsequently identified in the oxymonad Monoceromonoides (Simpson and Patterson, 2001; Simpson et al., 2002), Recent multi-gene molecular phylogenies have supported the monophyly of most, and probably all, Excavata, including Preaxostya (Hampl et al., 2009). The weight of molecular phylogenetic evidence suggests that Preaxostyla is most closely related to parabasalids and Fornicata, the other major groups of Excavata that lack classical mitochondria (Cavalier-Smith, 2003; Simpson et al., 2008; Hampl et al., 2009), however a closer relationship with Malawimonas remains plausible (see Simpson et al., 2006). 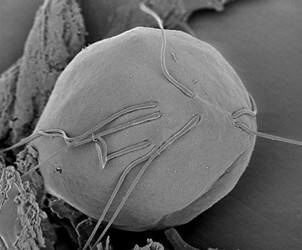 Cavalier-Smith, T. (2003) The excavate protozoan phyla Metamonada Grasse emend. (Anaeromonadea, Parabasalia, Carpediemonas, Eopharyngia) and Loukozoa emend. (Jakobea, Malawimonas): their evolutionary affinities and new higher taxa. Int. J. Syst. Evol. Microbiol. 53: 1741-1758. Dacks, J.B., Silberman, J.D., Simpson, A.G.B., Moriya, S., Kudo, T., Ohkuma, M. and Redfield, R.J. (2001) Oxymonads are closely related to the excavate taxon Trimastix. Mol Biol Evol, 18, 1034-1044. Hampl, V., Horner, D.S., Dyal, P., Kulda, J., Flegr, J., Foster, P.G. and Embley, T.M. (2005) Inference of the phylogenetic position of oxymonads based on nine genes: support for Metamonada and Excavata. Mol Biol Evol, 22, 2508-2518. Hampl, V., Hug, L., Leigh, J.W., Dacks, J.B., Lang, B.F., Simpson, A.G.B. and Roger, A.J. (2009) Phylogenomic analyses support the monophyly of Excavata and resolve relationships among eukaryotic "supergroups". Proc Natl Acad Sci U S A, 106, 3859-3864. O'Kelly C.J., Farmer M.A. and Nerad T.A. 1999. Ultrastructure of Trimastix pyriformis (Klebs) and similarities of Trimastix species with retortamonads and jakobids. 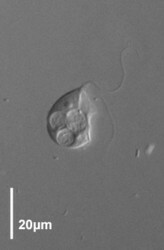 Protist 150, 149-162. Simpson, A.G.B. (2003) Cytoskeletal organization, phylogenetic affinities and systematics in the contentious taxon Excavata (Eukaryota). Int J Syst Evol Microbiol, 53, 1759-1777. Simpson, A.G.B., Bernard, C. and Patterson, D.J. (2000) The ultrastructure of Trimastix marina Kent, 1880 (Eukaryota), an excavate flagellate. Europ. J. Protistol. 36, 229-252. Simpson, A.G.B., Inagaki, Y. and Roger, A.J. (2006) Comprehensive multigene phylogenies of excavate protists reveal the evolutionary positions of "primitive" eukaryotes. Mol Biol Evol, 23, 615-625. Simpson, A.G.B. and Patterson, D.J. (2001) On core jakobids and excavate taxa: the ultrastructure of Jakoba incarcerata. J Eukaryot Microbiol, 48, 480-492. Simpson, A.G.B., Perley, T. & Lara, E., (2008) Lateral transfer of the gene for a widely used marker, alpha tubulin, indicated by a multi-protein study of the phylogenetic position of Andalucia (Excavata). Mol. Phylogenet. Evol. 47: 366-377. Simpson, A.G.B., Radek, R., Dacks, J.B. and O'Kelly, C.J. (2002) How oxymonads lost their groove: an ultrastructural comparison of Monocercomonoides and excavate taxa. J Eukaryot Microbiol, 49, 239-248. Slamovits, C.H. and Keeling, P.J. (2006) Pyruvate-phosphate dikinase of oxymonads and parabasalia and the evolution of pyrophosphate-dependent glycolysis in anaerobic eukaryotes. Eukaryot Cell, 5, 148-154. Monocercomonoides globus (Family Polymastigidae) from the hindgut of the North American wood-roach Cryptocercus punctulatus. Specimen is approximately 15 microns long. Saccinobaculus ambloaxostylus (Family Saccinobaculuidae) from the hindgut of the North American wood-roach Cryptocercus punctulatus. Specimen is approximately 80 microns in length. Page: Tree of Life Preaxostyla. Authored by Patrick Keeling, Kevin Carpenter, Vladimir Hampl, and Alastair Simpson. The TEXT of this page is licensed under the Creative Commons Attribution License - Version 3.0. Note that images and other media featured on this page are each governed by their own license, and they may or may not be available for reuse. Click on an image or a media link to access the media data window, which provides the relevant licensing information. For the general terms and conditions of ToL material reuse and redistribution, please see the Tree of Life Copyright Policies.